If you are from the Pacific Northwest, the scenario I’m about to tell you will be familiar. At the end of February, it looked like Spring was about to arrive. We had some really beautiful days and it seemed like maybe winter would be over early. Then on March 1st, we got a giant dump of snow. Everyone despaired. It seems to happen every year like this, and every year we seem to forget the outcome. While to some the snow looked really beautiful, it was also March 1st and we were done with winter (meanwhile, everywhere else in Canada was still waist deep in snow, and we really had nothing to complain about). Then as per usual, a few days after the snowfall it started raining. The days turned grey and the ground turned a mushy brown. Any snow that was left over was patchy and discoloured. Everything looked dismal. We know that here in the PNW when we get a snowfall there will inevitably be that gross period of cold rain and mud. We also know that in order to get the beautiful spring and summer that we love so much, that has to happen. Never have we woken up one day after a snowfall to see that the snow is all gone, the ground is dry and it’s warm and sunny outside. Sometimes the rain has to come, to clear away the last vestiges of winter and make way for spring. I’m pretty sure this phrase can apply to a lot of scenarios. For us, it meant that we had to be prepared for Lucy’s eating to be bad in order for her to learn how to get better. We had pretty miserable days (or weeks?) with weaning Lucy off of the feeding tube. After all, she had spend more than half her life getting fed that way, so we were working against a lot. We knew that she had to figure it out on her own though, and that meant having miserable days of her screaming constantly because she was hungry and just didn’t understand what it meant. It was ugly. Today though, she is over one month tube free and after months of miserable feeding, we are now on a normal schedule and our lives aren’t completely dictated by when/how well she eats. Oh, and guess what? Spring arrived. Just like it always does every year, and it’s be-a-utiful! “Rain” is the April writing prompt of The Mommy Blogger Collective. In addition to a monthly writing prompt, the collective hosts a monthly blogger featurette. This month we are featuring Katie of Hello, Little Bean. A few words from Katie — Hi! 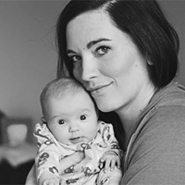 I’m Katie and I write a blog called ‘Hello, Little Bean.’ It’s about life as a new mom to my cute daughter, Lark Story. I’m California born and raised, but currently live in Michigan with my soon-to-be husband, James and my soon-to-be stepson, Brennan, as well as our little Lark and two kitties. I’m a full-time graphic designer who loves all things artistic and creative. I’m overly sensitive and sentimental, sarcastic and foul-mouthed at times, a foodie and a reality tv junkie who’s completely and utterly in love with motherhood. You can also find me on instagram, facebook, pinterest and our little online boutique, Bold Threads.